You don't think of a lawyer as the ideal character for the lead role in a hard-riding Western drama, but Chad Remington could fire a six-gun as adeptly as he filed a writ in Frontier Town. 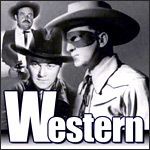 The series was not quite an adult western, but it was more substantial than the usual white-hat/black-hat kiddie fare. For half of the show’s run, it featured up-and-coming Hollywood star Jeff "Tex" Chandler as attorney Remington. He served as the local prosecutor in the new settlement of Dos Rios...while riding hard on the trail of his father's killer. Chandler left the series midway through the two-year production cycle, handing over the lead to longtime western film star Reed Hadley.